When the olives arrive at the mill, they are transferred to larger crates and weighed. Thus begins the milling process. The olives are tipped into a hopper from which they are picked up, little by little, by a conveyor belt and transferred to the washer. Washing takes place externally. The washed olives then enter the mill by the conveyor belt which can be seen to the left of the washer. The olives undergo a double wash to remove stems, twigs, leaves, dirt and other debris: In the first phase, they pass through a basin of water which gurgles energetically by means of air jets. To avoid wastage, this water is continually filtered and re-used and substituted only after a few hours. 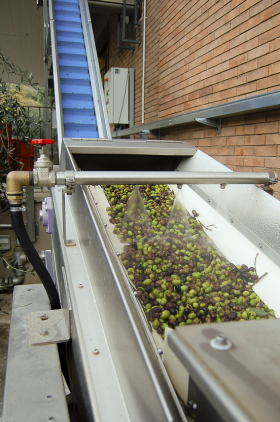 In the second phase, (illustrated here) the olives are rinsed with jets of fresh water. 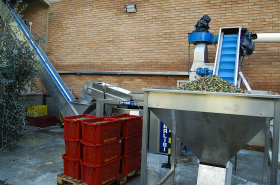 The conveyor belt which can be seen at the back, transfers the olives into the mill. Few know that the crushing of the olive is the phase which, more than anything, characterizes the olive oil produced and that the most delicate choice which faces every mill operator is that relative to the crushing. The concept is simple: the ‘gentler’ the crushing, the more delicate the resulting oil and moreover, low in polyphenols. The more ‘violent’ the crushing, the more bitter and stronger the resulting oil but with higher yield and higher levels of polyphenols. It is these polyphenols which are thought to provide important health benefits such as a healthy heart. The gentlest system of crushing is by traditional stone mill whereas the most violent is by a high speed hammer mill. Naturally, there are many intermediate solutions available. Since the Taggiasca olive already produces by itself an extremely delicate oil, a stone crusher risks producing an oil with too little aroma. For this reason, we have chosen a hammer crusher, of a somewhat advanced type, which works with a double-phase system and rotates at a relatively low number of turns. It involves a pretty sophisticated solution which allows us to obtain a product richer in polyphenols and hence, with more body and aroma, without, however, sacrificing its marked delicacy. The olives are first broken into large pieces by a series of stainless steel rotating hammers in the central part of the crusher. They then pass through a grill to a second stage where they are broken up into even smaller pieces and the crushing is completed. The resulting paste comes out through a second grill and is then transferred to the mixer. The second grill is, furthermore, interchangeable: the larger the holes, the shorter the time spent in the second stage. The grill is substituted according to the type of olive and their level of maturity, or according to the type of product that we want to obtain (more or less sweet, more or less aromatic). 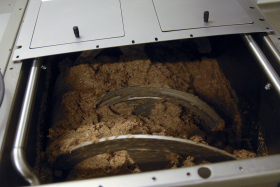 In the photo, the crusher can be seen at the top at the back, whilst in the foreground, one can see the mixer where malaxation or kneading of the paste occurs. The next phase of malaxation or kneading, during which the paste is slowly mixed in a tepid tank, is very delicate. The purpose of this phase is to favour the accumulation of the oil droplets, released during the crushing process, so that they can then be extracted from the paste. The temperature of the kneading process is very important: It must not exceed 27°, above which the extraction cannot be defined as cold (and besides which there is the risk of compromising aroma and fragrance), but neither must the temperature be too low which can cause a heavy loss in production. The length of time kneading is also critical: overdo kneading and one risks producing a colourless oil. In reality, the correct temperature and time vary greatly depending on the characteristics of the olive. Making the right choice is not easy. Rather than the theory, the eye of the operator is of great importance. Unfortunately, a modern mill has little of the romanticism of the mills of old: the ancient presses were substituted by centrifugal extractors (the so-called decanter) which do not allow one to see anything of the process going on within. However, the process inside is no less important. 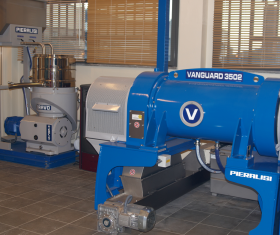 In Liguria, 99% of the decanters are of the type called three phase systems. To be able to separate the oil from the rest of the paste it requires that a large quantity of water is added together with the paste (broadly speaking, a large amount of paste – a large amount of water). 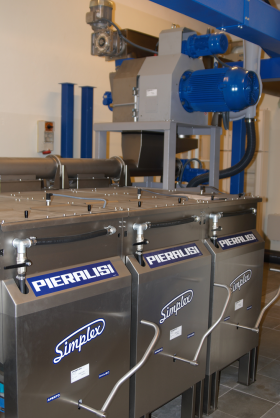 This produces oil, water and virtually dry pomace (the pomace comprises of the broken olive stones, the skin and the olive pulp minus the oil and water). The advantage of these decanters is that waste management is made easier since it consists of only water and a dry pomace. It may not seem much but on a logistic level, it makes a big difference. The disadvantage is that the added water tends to rob the oil even more of the polyphenols which are water soluble. Our decanter, on the other hand, belongs to the generation of so called two phase systems: it requires almost no addition of water and produces oil and wet pomace (that is to say, it contains all the water which naturally occurs in the olive). The disadvantage is the difficulty of disposing of the wet pomace afterwards (later on we will explain how we deal with it). The advantage is that the oil turns out richer in polyphenols, which means an oil fuller in flavour. 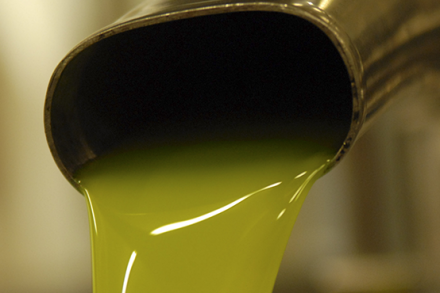 On closer view, it is a double-edged sword because, it is true that if the olives are good then this type of mill produces an even better oil but if the olives have any kind of defect or are not good, then these defects will become ever more noticeable in the resulting oil since they are not washed out by the addition of water. This is the area outside where the small fragments of olive stone are extracted from the pomace. On the left one can see the stone separator and on the right, the large tank where the pomace, minus the stones, ends up. The latter is periodically sent to companies which use it for the production of biogas. The stones, on the other hand, are stored and then used to fuel the boiler which one can see (red) in the background. With this we can heat, not only the mill but the entire building as well. Nothing is wasted.